Chief Joe Consiglio was married to Grace, in July 2003 lost his mate in this life. He resides in his home in Trenton, MI. Joe enlisted in the U.S. Naval Reserve, Detroit, MI in 1940. He took his boot training at NFB (NAS Grosse Ile) as an apprentice seaman and M/SGT Dorr was his instructor, later many will remember him as Warrant Officer Dorr with the Marine Detachment at the base. Initially worked at cleaning down the aircraft. Later worked on the line pre-flighting the N2S and N3N type aircraft. 1943 was transferred to Norfolk FFT to Port Lyautey (sp.) North Africa. Attached to seaplane patrols over the Straits of Gibraltar. In the fall of 1944 was transferred to Cecil Field, FL where he pre-flighted SBC's and SB2C's. Early 1945 before the Japanese surrender Joe was released from active duty. 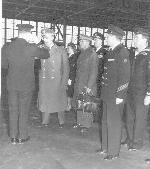 Upon hearing Grosse Ile was accepting Aviation Machinist Mates as Station Keepers, Joe reenlisted in July 1946. Worked in Air Maintenance and was the permanent JOOD for one year. Back to A/M Joe was assigned to Scheduling and Planning until his retirement in 1961.